Calculates and returns the contour line of a surface and the contour graph. X-coordinates of the points of the surface. The number of elements in x must equal the number of columns in z. If x is empty, this node assigns x values of [0, 1, N-1], where N is the number of columns in z.
Y-coordinates of the points of the surface. The number of elements in y must equal the number of rows in z. If y is empty, this node assigns y values of [0, 1, M-1], where M is the number of rows in z. Heights of the points defined by x and y. Height where this node calculates the contour line. This input changes to number of heights when the data type is a 32-bit signed integer. Number of contour lines that this node calculates. This input changes to height when the data type is a double-precision, floating-point number or a 1D array of double-precision, floating-point numbers. An XY graph that draws the contour line. Attributes of the contour line. Height of the contour line. This node calculates height by dividing the height deviation between the highest and the lowest point of the surface by number of heights and incrementing the lowest height by the retrieved quotient. For example, if number of heights is 10, the lowest and highest points in z are 100 and 600, respectively, which means, the height deviation between the highest and the lowest point of the surface is 500. The retrieved quotient is 50, and height has the following values: 100, 150, 200, 250, 300, 350, 400, 450, and 500. Coordinates and the closed status of the contour line. The coordinate of the start point of the contour line at (x, y) is different from the end point of the contour line at (x', y'). X-coordinates of the contour line. Y-coordinates of the contour line. A Boolean that indicates whether the contour line is closed. 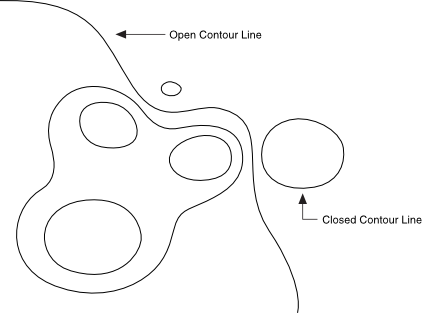 True The contour line is closed. False The contour line is open. Contour lines of a surface are line segments that connect points at the same height, as shown in equation f(x,y) = h.
The following figure demonstrates an open contour line and a closed contour line.